By the sixties it was clear that there was a need for more widespread use of signalised pedestrian crossings: increased traffic volumes meant that Zebra crossings were not the all-purpose solution they had once been. But the Ministry of Transport was reluctant to use the type of signalised crossing that was prevalent at the time because it held traffic up for too long and was very expensive. Clear carriageway markings, in line with Zebra crossings. A way for pedestrians to request crossing time. A delay before the crossing activates, allowing it to operate in time with nearby traffic signals and reducing the appeal of pushing the button just to see the lights change. This also meant devising a way of informing the pedestrian that their request had been accepted. A red signal to traffic to ensure pedestrian safety. A clear indication to cross, but no instruction not to cross because of legal considerations. A way to tell pedestrians that their time to cross was running out. Flexible crossing time so that traffic would not be held up longer than necessary. The system that was designed to meet those criteria was, more than anything before or since, the mongrel offspring of Zebras and signals. It had white triangles on the road, like a Zebra's white stripes, to indicate the presence of a crossing place. It had Belisha Beacons on top of its signals, but painted black stripes around them to indicate a different kind of crossing. It had push buttons for pedestrians, which responded with a 'WAIT' light while the lights changed. There was a 'CROSS' light to tell them when to go. So far so good. 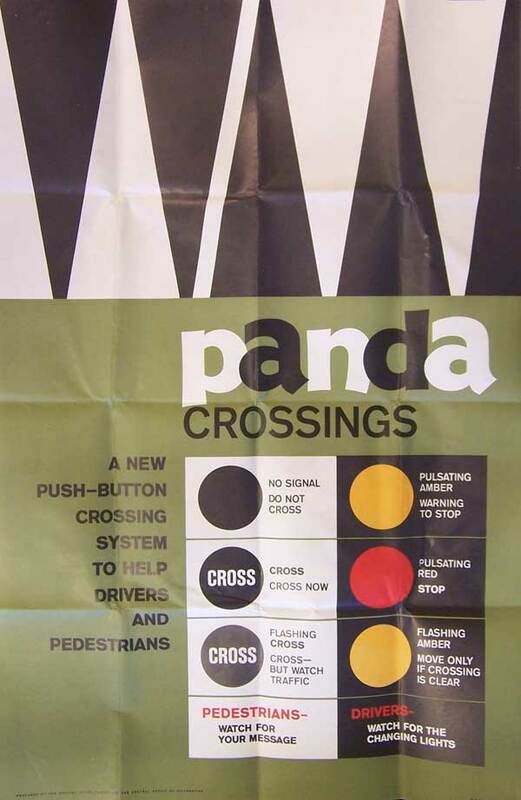 It even had a catchy name — the Panda Crossing. The name Panda seems to have been plucked from thin air, presumably as another black and white mammal like the Zebra. The motorist's side of things is where the Ministry got a bit carried away. A pulsating amber light warned traffic that people were about to cross and a pulsating red light then gave the instruction to stop while the 'CROSS' light came on. After eight seconds, 'CROSS' began to flash, and the amber traffic light returned, this time flashing. Pedestrians then had seventeen seconds of Zebra crossing-style priority, during which time 'CROSS' flashed faster and faster. The Ministry was careful to distinguish between the lights that pulsated and those that merely flashed: the difference, apparently, is that a pulsating light never completely goes out. And after all that, the lights just switched off, indicating that traffic could move freely once more. A huge publicity campaign was mounted. Posters and leaflets were drawn up and a 60-second promotional cartoon commissioned. In the key trial sites of Guildford, London and Lincoln, the film was shown in cinemas and police were sent out to show it in schools. Every schoolchild got a copy of the leaflet. The press were enlisted and bullied into reporting on the experiment a second time again a week later. The film got national television coverage. Surely this media blitz couldn't fail to get the public accustomed to the new crossings? Transport Minister Ernest Marples unveiled the very first Panda Crossing on York Road, just outside Waterloo Station in London, on 2 April 1962. He and the Mayor of Lambeth were the first to cross it, with the Mayor carrying a cuddly toy panda. From the very beginning it was poorly received. It ticked every box on the government's wish list, but the problem was that it was absurdly complicated to use, with convoluted sequences of flashing and pulsating lights, some steady and some getting faster. At the end of the sequence, all the lights would disconcertingly just switch off. It was beyond most of those who tried it out that April morning. One old lady interviewed by the BBC declared "that man Marples is up to too many tricks. It's a hairbrained scheme and most dangerous!" Regardless of practical considerations, the Ministry was now committed to the Panda Crossing experiment, and before long the trial was being rolled out across the country for wider assessment. The Panda was, at the very least, received with a guarded attitude by the public. Motorists found the array of flashing and pulsating lights confusing, and in particular were disconcerted by the fact that there was no indication that they could proceed. While the Panda Crossing was being forced onto an uncertain country, Ernest Marples was aware that further, more drastic measures might be needed to improve road safety in urban areas, and as such an even more radical experiment was set up to run the following year: the Controlled Traffic Area.